We turned over a quick project early last week for TG Woodware. 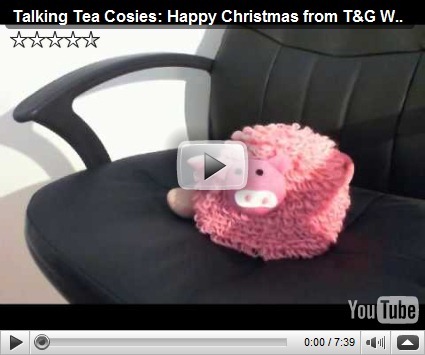 Following on from the demonstration videos and Kitchen Factory video, we produced a Christmas Message on their behalf, with some animated tea cosies. We recorded this “Creature Comforts” style. A few of the lines were scripted, the rest of them were made by basically having ordinary people talking in their normal voices answering questions that I asked them about their lives. The result is quite funny, and I’m hoping we can make some more next year. It’s a nice little Christmas message! And a quick, fun project.